1. Can I customize my engagement ring/ wedding band? Definitely! At Michael Trio, we take pride in providing pristine service and the best quality of wedding bands and engagement rings. If you do not see something you like, feel free to give us a call or send us an email with pictures of what you have in mind. 2. How long will it take for customization? Good things are worth the wait! Your customized ring will minimally take between 4-6 weeks, or up to 2 months, depending on the level of customization that you may require. 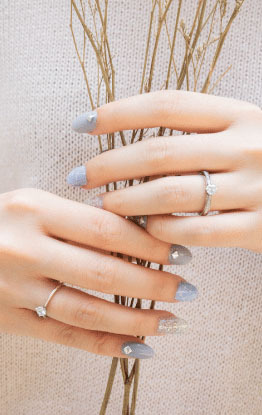 If you really wish to grab-&-go, you may opt for our in-stock rings. 3. Can I view diamonds first before buying? Our option to purchase online is to provide an alternative for customers who are too busy, or prefer the ease of convenience. However, as our diamonds are ordered directly from our suppliers, we do not keep stock of most of the diamonds in our diamond list. 4. Can I bring my own diamond or gemstone to set onto a setting purchased at MT? This is dependent on a few factors and requirements set by us, and will be assessed on a case by case basis. If your diamond or gemstone meets our requirements, we can help you set your stone onto our settings. Do note that there will be charges for setting these stones as well. 5. Which Credit Card(s) can I use for installment payment? Currently, we only accept UOB Credit Cards, for up to 12-months interest-free installments. However, do take note that payment through installment can only be processed for purchases made at our showroom, and is not applicable for online purchase. 6. Where is the shop located? We do welcome walk-ins, however do bear in mind that you might be expected to wait if our showroom staff are busy attending to other customers. In order to ensure that you are not left waiting, we highly encourage all patrons to either call in or head to https://www.michaeltrio.com/make-an-appointment to confirm an appointment. 8. Do you provide international shipping? 9. What if the recipient's ring size is different, is it possible for me to exchange it for a different size? Michael Trio will resize your ring free of charge for you within the first 60 days of purchase. However, take note some types of rings like eternity rings and tension rings cannot be resized and have to be completely re-manufactured. That being said, it is important to order the correct size at the time of your original purchase. 10. How do I check my ring size? We offer a complimentary ring-sizer just for you. Head to https://www.michaeltrio.com/request_free_plastic_ring_size.php to get yours now! We regret to inform that this is only limited to patrons with a Singapore address. For our international visitors, you may wish to head to https://www.michaeltrio.com/media/wysiwyg/ring_sizer_chart.pdf to check your ring size online. 11. I have a certain set of diamond specifications I would like to check the price for, is there a rough diamond price chart? Alternatively, you may call in at 62990110 to speak to our consultant, as the prices of each diamond varies depending not only on the quality of the 4Cs, but on other factors that affect the pricing of a diamond, such as fluorescence and certifications.